September 22nd-29th to raise money to expand the Backpack Program throughout our district. This program allows us to send food home with students over the weekend. Orange Out Day, September 22nd, will be our big district-wide kick-off, and we’ll start collecting change on this day. 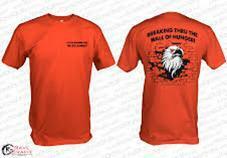 We’re asking everyone to wear orange – the color designated for this cause or your new No Kid Hungry t-shirt. Stay tuned for more Orange Out info! Thank you so much for supporting our efforts. PLEASE RETURN BY Friday, September 15th. Please make checks payable to CMS.